Professional grade casino chips used in table games are a cut above what is available to the average person. Pick up a casino chip from any casino, but especially one of the big name casinos on the Strip, and you will notice that special ‘Je ne sais quoi’ that leaves you rolling the chip over in your hands in some sort of ill-defined tactile delight. But, what is that special component, exactly? Have you have you ever found yourself wondering the same? You are not alone. The short of it, however, is this: we’re not allowed to tell you. Fortunately for the curious, there are some things that I can say regarding this topic. While I cannot tell you the exact ratios or the method in which it all comes together, or the number of lasers required, I can tell you the primary materials that you will find in any given casino chip. Most casino chips will be majorly comprised of clay; however, going back as far as the 1950s, no casino chip has been made entirely of clay. Often times the chip will be made from a composite material that includes other earthen minerals such as sand and chalk. We’ll talk more about minerals in a little bit. What is important to remember is that if it’s on the planet, you could find it in a clay casino chip. Around the 1980’s, ceramic chips began to hit the scene, and their popularity increased due to the fact that you could print designs and patterns on the entire chip, instead of just the inlay (the middle) as what the case with clay chips. Ceramic chips have the detriment of being easier to counterfeit than clay because of a lack of that said inlay, which acts as a sort of a tamper-proof mechanism. If you have really been acting naughty this year, Santa will make you play with a set of metal slug chips. Like the name implies, these chips, usually used at home, are simply pieces of metal covered with a thin layer of plastic and a logo. They are known for having an unbalanced weighting and just in general being the lowest quality option of the three because they sound like you are playing with Lego. Sometimes casino chips will include some fairly sophisticated inventions. As technology advances these security countermeasures continue to advance as well. In the old days it was just stamped with “We’re watching you, Mister” on the back. The Wynn and Encore casinos in Vegas have tried their hand at using RFID-enabled chips for strategic reasons: the prevention of counterfeit chips. Even though counterfeiting is not overly common due to all the safeguards already put into casino chips, RFID does offer an extra level of security, and the ability for casinos to track the location of chips relative to the player they have been assigned or otherwise registered to. Plus it’s just kind of cool. Similar to the above, some casinos will opt for UV markings set into the inlay of the chip. This invisible security measure is yet another level of security redundancy worked into casino chips to ensure that the only people using them are the people paid the casino for them as opposed to printing them off their 3D printer. You hear a lot of stories working in the casino industry, and you learn that the only thing more strange and superstitious than the players that traverse the technicolored dream carpeting of the floor with you is that the owners of the casinos can sometimes be even more strange and superstitious. Think about it: who decided on that carpeting in the first place? Anyone who knows anything about gambling knows that it is steeped in ritual and magic. In that tradition, here are some “witches brew” options that are pretty unbelievable…and yet somehow more believable than they should be. Perhaps the truth to the secret of casino chips can be explained by more conventional methods, like the inclusion of rare minerals that would elevate the build quality of the chips significantly, and give them a premium intangibility? You know, that “special shine” that seems like it could only have been mined out of a cave somewhere. If you feel that you are worthy of the casino chip industry secret, there is a way that you can be introduced into these upper echelons of knowledge. Your quest into the gambling occult can be made a reality, but you will need much practice. I suggest the great online games here at Silver Oak. 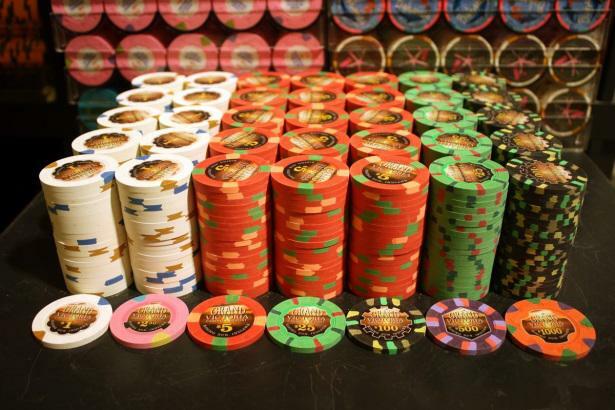 Our casino chips are the most illustrious of all the (digital) chips, and you will train with the best if you are to become a champion chip maker. There are only ever 19 on earth at any one time.